Do you and your friends have what it takes to solve the ghostly riddles of…MYSTERIUM? Ever since the glory days of HeroQuest I’ve always been interested in boardgames that can be played out as a campaign. That is, you play as the same character over the course of several games, getting new gear/powers to help you overcome evil. The truth is that even back in the time before work, responsibilities, and internet cat videos I RARELY managed to successfully finish a campaign. OK you’ve read the name, feel free to hum a few bars of the R.E.M. song in your head so that we can get on with the review. You good? Alright, let’s move on. Welcome back to a very special installment of the F:AT Snack Attack. In previous articles we’ve looked at Kettle Corn and the world’s tastiest corn taquito chip. This time I’m going to be covering something very near and dear to my heart. Something that I’m sure many of you are all familiar with. Yup, it’s the tasty green concoction which looks like Re-animator serum. It’s Hi C’s Ecto Cooler! 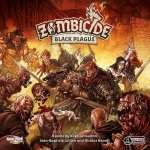 Like any horror franchise worth its salt, Zombicide is back with another installment. Just like most horror sequels this one has a twist! Wizards and Warriors are the new flavor du jour. Chainsaws have become broadswords and uzis are now crossbows. So besides a stylistic face-lift does this new version improve upon the game in any meaningful way? Sometimes I let my inner Brett Michaels get the best of me. When it comes to boardgame themes and settings I need a chance just to get away. I gotta get a break from the same old, same old. So in my never ending quest, looking for nothing but a good time, I tend to search every nook and cranny for weird games. Make no mistake, The Bloody Inn is WEIRD.